Have you ever wanted to become a plumber? There are many ways to go about becoming a plumber. One method would be obtaining a formal education at the high school and/or undergraduate level. Another path would be to become an apprentice at a plumbing company in order to learn the trade from the professionals. Once your foot is in the door, many hours of training are required. Finally, obtaining a license is the final step to becoming a certified plumber. Many aspiring plumbers will enter into a vocational and technical high school program. These high school programs are designed to balance classroom academics with practical workshop academics. This helps students build basic school knowledge, as well as knowledge about plumbing. Although a college education is not required, it is always a plus to have college credits. College helps educate students on much more than a field of study, helping to build more well-rounded citizens. There are also certificate programs aspiring plumbers can take advantage of. An apprenticeship is arguably the most important step in becoming a plumber. In a few years of both classroom and on the job training, an apprentice can be transformed into a professional. Apprenticeships are typically offered by local unions and also by non-union contractors. According to the Bureau of Labor Statistics, an apprenticeship should provide between 1,700 and 2,000 hours per year of training and work. Apprenticeships can be paid, unpaid, or a combination of both. 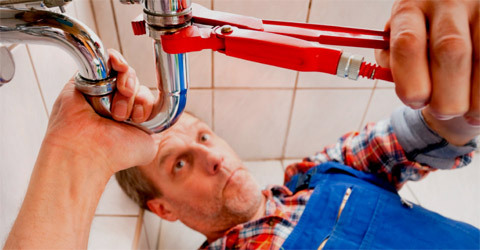 A plumber should receive many hours of both classroom training and on the job training. Once the required numbers of hours of training have been completed, a plumber is then certified to work on his or her own. A plumber should also receive training for customer service. Great customer service skills can be the difference between a client deciding whether to do business with the company in the future or not. Although there are not any national requirements for plumbing licensure, most states require a plumber to obtain a license. A license usually requires a certain number of hours worked before being eligible to apply. A written test may also be a requirement to obtaining a license to be a plumber. A plumber may also expand his or her knowledge and expertise in the field by earning professional certifications, such as an Energy Efficiency Certification. If you aspire to own a plumbing company one day, then you may want to consider a college education focusing on business. Although not a requirement, having a knowledge of business is a great help for an entrepreneurial plumber. Other plumbers who wish to start their own companies will rely on their experience in the field alone. However, these professionals may find themselves needing a partner or additional employees who are more business savvy.